All 18 Footaction promo codes have been verified and tested today! Joining the Star Club is your way to the best deals at Footaction. When you sign up you will automatically receive a Footaction coupon for $10 off a purchase of $50+. If you continue to make big purchases once you spend $225 over in one calendar year you will be upgraded to the Gold Star Club where you can earn reward cards for every $100 you spend. One way to stay in the link about the latest product drops, sales, and Foot action coupons is to follow their social media channels like Twitter, Instagram, and Facebook. Find them at @Footaction- your feet will thank you later. The easiest way to get free shipping is to find a Footaction promo code, but if you can’t happen to find one you have another option- just make sure to have your order total add up to over $75 then standard shipping will automatically be free. If you aren’t happy with your purchase you have 45 days to return your item. If you realized you ordered the wrong size- don’t fear about paying for return shipping. If you exchange the item you will not be charged a fee on the return shipping. If someone in your life is itching to get a new pair of sneakers but you aren’t 100 percent sure on the color or maybe the size, don’t worry about buying the wrong ones! Just gift them a Footaction gift card. You can either get a physical card sent to you in the mail to wrap up and give as a gift or select an e- gift card and it can be sent straight to the recipient. You can make them for any amount between $10 and $250 so they can be used on shoes of any budget. They also can be used in combination with a Footaction coupon code. When you just can’t find a Footaction coupon code to save big there is still a super easy way to save. It’s as simple as just checking out the sale section. You can get all your favorite shoes and clothing items for men, women, and kids. All your favorite brands like Nike, adidas, Vans, and many more are regularly put on sale. If you keep an open mind you can get the hottest kicks at the lowest price like Jordans, Air Force Ones, Boosts and many more. Footaction wants to pay their respect to those in the military by offering a special 20% off Footaction coupon that works on most purchases. This discount applies to active duty personnel and well as retirees and veterans that are continuing to receive military benefits. 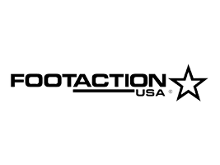 Footaction takes this discount to the next step by also offering the savings onto any spouses or dependents of that active personnel or retirees receiving benefits. Stay in the loop with everything happening at Footaction easily by just signing up to receive their email newsletter. When you sign you will receive an email with all the updates on new releases as well as special sales and discounts. You might even luck out and receive an email exclusive Footaction promo code or a notification to enter a sweepstakes. It couldn’t be easier to sign up for the newsletter. All you have to do is visit the Footaction homepage and scroll to the bottom of the page and look on the right-hand side for an envelope icon and “Email Exclusives”. Select “Email Sign Up”. You will be forwarded to the sign-up page.